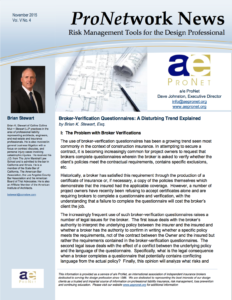 The use of broker-verification questionnaires has been a growing trend seen most commonly in the context of construction insurance… Historically, a broker has satisfied this requirement through the production of a certificate of insurance or, if necessary, a copy of the policies themselves which demonstrate that the insured had the applicable coverage. 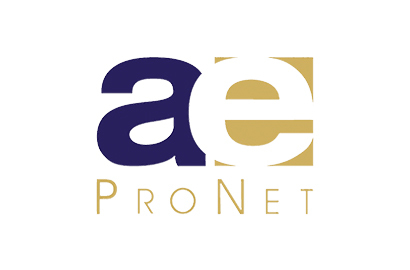 However, a number of project owners have recently been refusing to accept certificates alone and are requiring brokers to complete a questionnaire and verification, with the understanding that a failure to complete the questionnaire will cost the broker’s client the job. 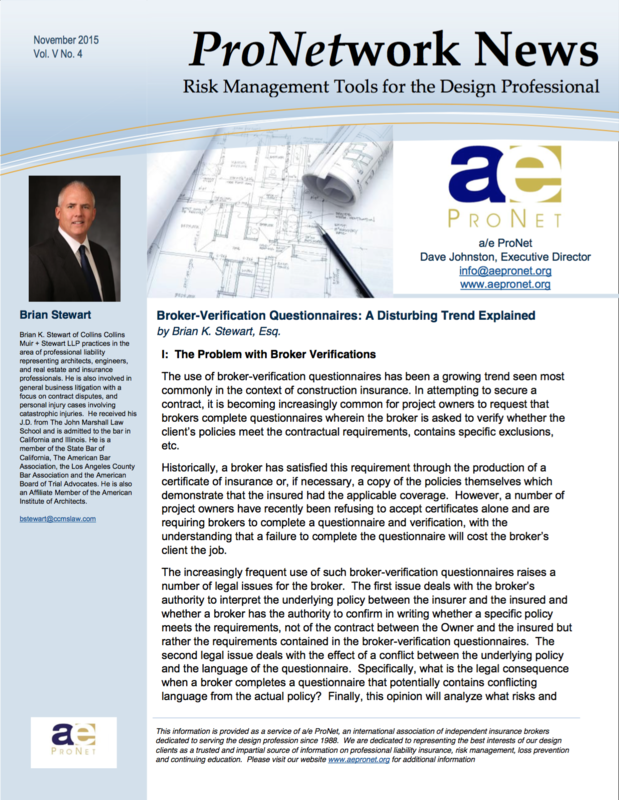 The increasingly frequent use of such broker-verification questionnaires raises a number of legal issues for the broker. The first issue deals with the broker’s authority to interpret the underlying policy between the insurer and the insured and whether a broker has the authority to confirm in writing whether a specific policy meets the requirements, not of the contract between the Owner and the insured but rather the requirements contained in the broker-verification questionnaires. The second legal issue deals with the effect of a conflict between the underlying policy and the language of the questionnaire. Specifically, what is the legal consequence when a broker completes a questionnaire that potentially contains conflicting language from the actual policy? Finally, this opinion will analyze what risks and liabilities a broker is exposed to when completing a questionnaire that contains language that is in conflict with or amends, modifies, expands, etc. the underlying policy. Insurance is a matter of contract governed by the rules of contract. Unlike the ordinary commercial contract where the parties seek to ensure a commercial advantage for themselves, an insurance contract seeks to obtain some measure of financial security and protection against calamity for the insured. Being a voluntary contract, as long as the terms and conditions made therefor are not unreasonable or in violation of legal rules and requirements, the parties may make it on such terms, and incorporate such provisions and conditions as they would see fit to adopt. The rights and obligations of parties to an insurance contract are determined by the language of the contact and the insurance policy is the law between the parties unless the contractual provisions are contrary to public opinion or law. Relevant distinctions exist between an insurance agent and an insurance broker. Whereas an agent generally represents a particular insurance company, an insurance broker generally represents only the insured. Consequently, an insurance broker owes a duty to the insured and not the insurer. The first issue deals with the authority of brokers to interpret the underlying policy when completing broker verification questionnaires. As a general rule, the interpretation of an insurance policy is a question of law. Therefore, it is the court’s responsibility to determine coverage issues. Courts have long recognized that in construing an insurance policy, the primary function of the court is to determine and enforce the intentions of the parties as expressed in the insurance contract. When faced with an interpretation question, courts first focus on whether the language of the policy is unambiguous. If the words contained in an insurance policy are “clear and unambiguous”, a court will afford those terms their plain, ordinary and popular meaning and apply them strictly as written. However, where policy language is susceptible to more than one reasonable interpretation, the language will be deemed to be ambiguous and will be construed against the insurer as the drafter of the policy language. This has been an excerpt of Broker-Verification Questionnaires: A Disturbing Trend Explained. To continue reading, download the free PDF version of the newsletter here. Brian K. Stewart of Collins Collins Muir + Stewart LLP practices in the area of professional liability representing architects, engineers, and real estate and insurance professionals. He is also involved in general business litigation with a focus on contract disputes, and personal injury cases involving catastrophic injuries. He received his J.D. from The John Marshall Law School and is admitted to the bar in California and Illinois. He is a member of the State Bar of California, The American Bar Association, the Los Angeles County Bar Association and the American Board of Trial Advocates. He is also an Affiliate Member of the American Institute of Architects.